Our on-site distillation facility can accommodate subcontracting distillation for your plant-based product. If you grow an aromatic crop, or are interested in trialling some, we have a variety of distillation facilities at Inglenook Farm that can distil quantities of plant material ups to 4 tons at a time. 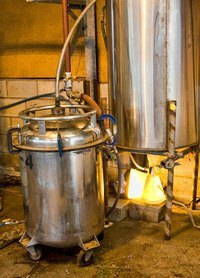 We can offer a unique distillation service, producing your unique essential oil or hydrosol for you within 48 hours* of receiving your fresh or dried crop. If you are interested in our expertise in steam distillation for your crop, don’t hesitate to get in touch for more information & costs. *Please note, time scales for turn around are subject to Essencia's own harvesting and distillation schedule. We will always endeavour to advise you before confirmation of any anticipated delays, however some delays may not be forseeable.